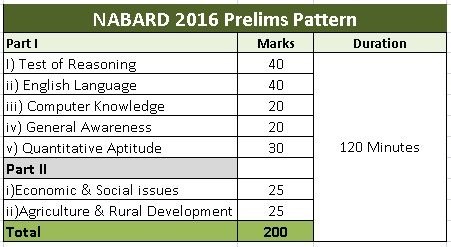 The NABARD bank exam for recruitment of assistant managers (grade A) & managers (grade B) was conducted on May 15, 2016.Since nabard does not get involved in commercial banking like other public sector banks & purely dedicated for agriculture & rural developement, many candidates had applied for a total of 115 vacancies.So here is the NABARD exam review & expected cutoffs. The NABARD grade A & B exam pattern consists of two phases just like the regular IBPS bank exams.The 1st phase is preliminary examination (prelims) for 200 marks. Only those who score the necessary sectional & total cutoffs will be shortlisted for phase II (main exam).Going by that rule, candidates with 110+ attempts out of 200 can be considered as safe. With 7 papers & 200 questions to answer in 2 hours, how did the candidates perform?Here is the exam review. Quantitative Aptitude was considered to be the toughest among all the sections.Many candidates were stuck here trying to answer some very high level questions. Of the 30 questions in QA, most were able to solve only between 10- 15. Reasoning was another section that spoilt the party for many candidates.Though not tough like QA, questions were above normal level that had to be answered after some calculations only. English, Computer Knowledge & General Awareness were quite easy with only few questions turning out to be tricky.Maybe these sections being a part of all banking exams proved to be a known feild for many. Economic & Social Issues and Agri & Rural development sections were most feared.But candidates found it too easy as many had attempted 35+ in both. Overall Review:The overall view of this NABARD exam is moderate except for reasoning & quants.Because of these two papers, candidates were left with only little time to answer all other sections. This has also affected the chances of few people who couldnt attend questions even though knowing the answers, due to lack of time. There is negative mark for wrong answers.So it would also play an important role in lowering the scores further. We had already published the NABARD previous year cutoffs but this year`s pattern is different compared to last year. Due to moderate performances of candidates in few papers & less number of vacancies, the sectional cutoffs could be slightly less or similar to last year. What could be the total cutoffs? The exams were conducted in 3 shifts & difficulty level was different in each slot. While 1st candidates felt the paper was easy, the toughness increased for reamining shifts. If you had answered the above number of questions correctly, you can be hopeful of qualifying for the main exams.